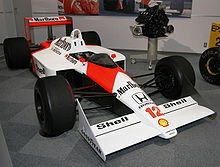 Vodafone McLaren Mercedes (McLaren Racing Limited) is a Formula 1 racing team. McLaren was started by Bruce McLaren in 1963. McLaren's current drivers are Jenson Button and Fernando Alonso. Jenson Button was the 2009 World Champion. McLaren also make some other cars at its Woking factory, like the Mercedes McLaren SLR supercar. 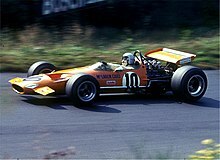 Bruce McLaren driving his own team's car at the 1969 German GP. He got the third most points in Formula One in that year. This page was last changed on 24 February 2018, at 09:31.